An elegantly simple design which could be worn day and night. This classic will never go out of style or date – a great inexpensive basic creation for the discerning woman’s wardrobe. 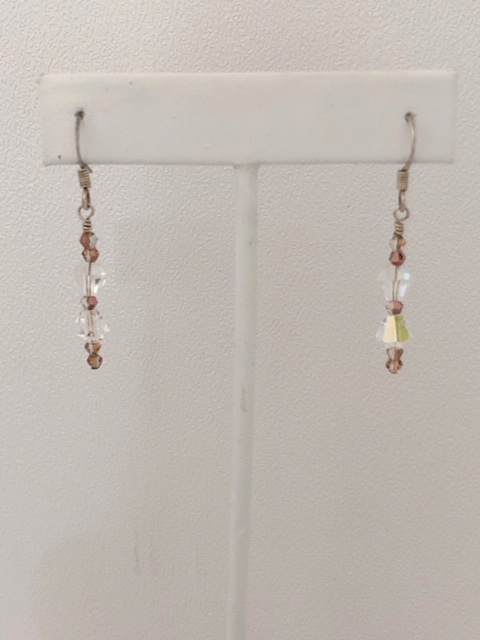 A delicate pair of clear crystal earrings from our Children’s and Teen’s Collection. The perfect gift for a young lady. 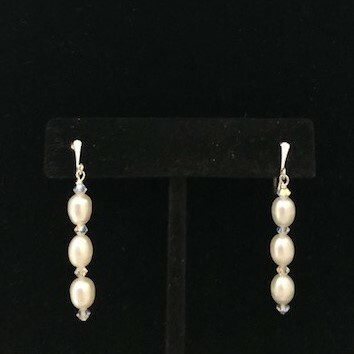 A truly stunning pair of earrings with iridescent crystals and white pearls. These earrings will make any woman feel like a queen – they are very beautiful! The natural radiance and interesting shapes of the irregular fresh water pearls makes this spectacular multi-strand necklace a “must have”. It can be worn twisted or flat, night or day, formal or casual – and it will always be the perfect accessory! Pearl: This is the “Stone of Health” – it brings inner peace. It represents innocence and purity, and it enhances endurance and emotional stability. They can especially enhance personal integrity. It is said to benefit the lungs. Cream colored pearls project success to the wearer. A lovely simple design comprised of a silver plate chain interspersed with fresh water pearls and facetted crystals. The tiny heart in the middle of the necklace adds a very special touch to this delightful necklace. A charming necklace with a tiny silver plate heart to compliment the lovely bicone crystals and fresh water pearls. The long silver spacers add a light and airy feel to the design. A delightful combination of fresh water pearls and bicone crystals, complimented by a crystal heart. This creation will be worn and enjoyed for many years. A classic, elegant look with just a touch of “sparkle”. 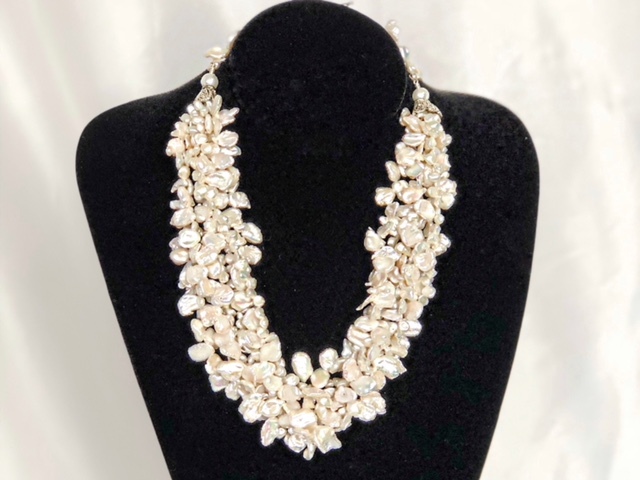 The large silver crystals spacers could stand alone – they are that lovely, but being surrounded by large fresh water pearls makes them a very special feature. Pearl: (Fresh Water) This is the “Stone of Health” – it brings inner peace. It represents innocence and purity, and it enhances endurance and emotional stability. They can especially enhance personal integrity. It is said to benefit the lungs. White pearls are said to promote good health. This crystal and glass necklace is “bonita” – beautiful! The blue crystals shimmer and offset the clear crystals. This creation is appropriate for all ages and will be spectacular with the right outfit. An exquisite lace-style collar necklace of pearls, silver seed beads and sterling silver. This necklace is a show-stopper in every sense of the word and will be admired by all. Classic sophistication! Elegantly beautiful, is the best way to describe this lovely collection. It speaks to the exquisite beauty of Nature which offers us an abundance of flowers enhanced by the sparkling dew. All these concepts are expressed in the elements of these necklaces.